Situated in Lower Greenville’s Delmar Heights Addition within the historic Belmont Addition Conservancy District and conveniently near Tietze Park, shopping areas and Greenville Avenue’s eclectic restaurants, this striking clean lined traditional residence, with its cedar wood exterior, is nestled on a 50’ x 140’ beautifully landscaped lot with two front driveway spaces and an abundance of mature trees and Crepe Myrtles. 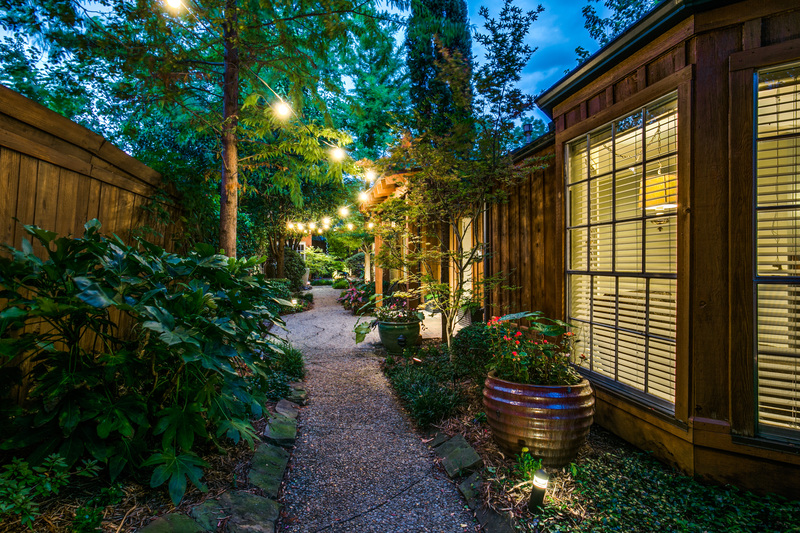 As you enter the exterior door to the premises, the fabulous home reveals an outdoor oasis of gorgeous landscaping, Cypress, Crepe Myrtles and Japanese Maple trees and landscape lighting. With keeping the timeless charm of the original home, the home was recently updated to include new fresh white paint, new piers and bamboo hardwoods in the living room, new carpeting and a new white marble guest bath. Additional details include an open floor plan, spacious entertaining rooms, gleaming travertine and bamboo hardwood flooring, deep molding, art, recessed and track lighting, and fabulous marble, glass, and porcelain tile finishes throughout. Sophisticated and stylish, enter the eclectic one-story home to an inviting entry, which gleans with fresh white paint, track lighting trimmed with deep molding, gleaming travertine floors and a coat closet. Providing great entertaining flow, the front foyer leads to both the master suite and study and also to the rear of the home. Travertine flooring and fresh white paint continue to a spacious kitchen, which is capped by a 10-foot vaulted ceiling, with track lighting and a stainless steel pendant light, and centered by a slate surrounded fireplace, with a wood carved mantle. The kitchen also boasts a glass mosaic tiled backsplash, hanging pot rack, premier stainless steel appliances, including a Capital commercial gas range, Bosch dishwasher and an Edgestar wine cooler refrigerator, expansive breakfast bar, and also opens to a formal living-dining room. Showcasing new piers and handsome bamboo hardwoods, the oversized living-dining room is highlighted by built-ins, art and recessed lighting, and French doors conveniently open to the outdoors. A door also opens to the side deck and grounds. Adjacent, a guest wing is appointed with a generous-sized bedroom, including new neutral carpeting, dual sconces, a large closet and is also served by a stunning new white marble and mosaic tiled bath, featuring a white pedestal sink and a separate shower with body sprays. At the opposite end of the residence, the luxurious and private oversized master suite is centered by a porcelain surrounded fireplace, with a wood carved mantle, and also features a wall of built-in bookcases with storage, including space for a flat screen television, new neutral carpeting, dual sconces and art lighting, and a light-filled sitting area with bay windows. Additionally, the master suite is highlighted by a spacious private study with handsome bamboo floors, deep molding and windows overlooking the side grounds, His and Hers huge walk-in closets and a sophisticated porcelain tiled master bath. Featuring heated floors, the wonderful master bath is accented with His and Hers vessel sinks and an oversized jetted tub shower with glass tiled accents and body sprays. Adjacent, a utility room houses built-ins with ceramic tile flooring and also opens to the side deck and grounds. Outside, the gorgeous landscaped grounds set the tone for a sophisticated atmosphere for entertaining. An expansive courtyard surrounded by gorgeous plantings, Cypress, Crepe Myrtles and Japanese Maple trees, a contemporary fountain and landscape lighting leads to a spacious outdoor deck area with an adjacent covered wet bar, featuring abundant built-ins, with concrete counters and a stainless steel bar sink, space for a refrigerator, and French doors opening to the courtyard. A dog run lined with flagstone steps and a storage shed completes this fabulous residence.